There was no hesitation in Alex Ovechkin’s voice. One day after the National Hockey League announced it will not participate in the 2018 Olympics in South Korea, the Washington Capitals star doubled down and reaffirmed his commitment to play for his country next February – with or without league approval. Ovechkin’s handshake agreement with Capitals owner Ted Leonsis is the quagmire that could threaten to throw the NHL into chaos next February. “If Alex Ovechkin and Braden Holtby and Nick Backstrom tell us, ‘We want to go play for our country,’ how am I going to say no?” Leonsis told NHL.com in February. “I might get fined. I might get punished in some way. But I feel I’m in partnership with Nick and Braden and Alex." Capitals forward Evgeny Kuznetsov told reporters on Tuesday he also intends to play for Russia. Holtby, Backstrom and T.J. Oshie were less committal. The expectation is that the NHL will step in to stop all potential individual player participation in the 2018 Olympics. NHL commissioner Gary Bettman sent a memo to all 31 clubs on Monday instructing team officials to not comment on potential individual participation, saying that the league will rule on the subject. You can rest assured that a team of lawyers on Sixth Avenue in Manhattan is already working on that policy, with the goal of quelling the chatter of a revolt sooner rather than later. NHL deputy commissioner Bill Daly admitted on March 17 – more than weeks before Monday’s announcement ¬– that the league was already contemplating how to combat a free-for-all. Daly declined to comment further about the league’s response on Tuesday. So, what can the NHL do to curb individual players from leaving their club? One option would be to issue a rule stating that any player who leaves his club next February to play in the Olympics will be banned from playing for his team for the remainder of the season, including the Stanley Cup playoffs. The belief is any such unilateral order would quickly be grieved by the NHL Players’ Association, who would likely feel that stiff a penalty and change to the rules would need to be bargained. There are a number of other, more creative options on the table. According to the Collective Bargaining Agreement, any player under NHL contract leaving his club to play for another without being loaned is grounds for a material breach of contract. A club could then seek to terminate that player’s contract, and even potentially sue that player for millions in damages that occurred as a result of the breach, including an impact on the team’s poor performance or lost revenue due to reduced attendance. 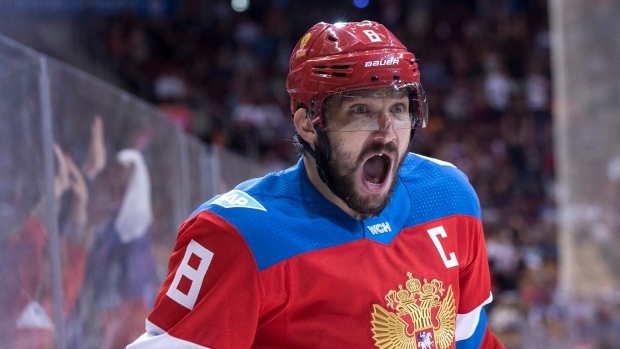 If a player like Ovechkin were to follow through and go to the Olympics with Leonsis’ permission, such a breach of contract would probably not be contested. The Capitals wouldn’t want to terminate Ovechkin’s contract or hold him liable for damages. But what if Leonsis and other team owners don’t have a choice? In other words, Bettman could issue a decree that any breach of contract by a player not pursued by his club would be subject to a fine of $10 million. Would Leonsis write a cheque for $10 million for Ovechkin to play in the Olympics? What about for Kuznetsov, Backstrom and Oshie? That’s an expensive trip to South Korea – not to mention it would significantly weaken the Capitals for three weeks next February, which calls back into question the integrity of the league. The league would undoubtedly be in an incredibly tough position if 200 upper-echelon players stood in solidarity with Ovechkin and decided to leave en masse next February to play in PyeongChang. A number of factors would likely prevent that from happening. For one, Hockey Canada and USA Hockey – among other federations – would have to ignore the NHL’s stance on the Olympics and select or invite NHL players to join their roster. That’s unlikely to happen, considering both federations receive millions in funding from the NHL each year. Powerful player agent Pat Brisson of CAA Sports said he has advised his players to speak out in support of Olympic play. But for every outspoken Ovechkin, there is a lukewarm Sidney Crosby, who is also a Brisson client. Holtby also said Tuesday his No. 1 priority would be with the Capitals, not Team Canada. Plus, even if 200-plus NHL players decided to revolt next February, the NHL could potentially charge the NHLPA with unfair labour practice, leaving them to battle it out with the National Labour Relations Board. The NHL could argue that players walked off the job in what’s called a “wildcat strike,” or an action undertaken by unionized workers without union leadership’s authorization, support or approval. The NHL would have a strong case in that fight, since the NHLPA agreed in Article 7.1 of the current CBA to not strike. Naturally, many are wondering if the NHL’s decision this week will have an impact on labour peace. The NHL can opt out of the current CBA - which Bettman recently attempted to extend in negotiations with the NHLPA over the Olympics - on Sept. 1, 2019. The NHLPA can opt out on Sept. 15, 2019. Meanwhile, many players offered their belief that the door remains open for NHL players to go to the Olympics – even if it is unclear which party will step up to convince the NHL. Carey Price wondered aloud Monday whether the NHL’s statement was little more than a negotiation tactic. “I’ll believe it when I see it,” Henrik Sedin told reporters. “I don’t know if they’re posturing or what,” Matt Duchene reporters. “For some reason, for me, I still think it’s going to happen,” Oshie told reporters. Ovechkin also called the NHL’s bluff. After all, suddenly deciding to participate is the only way to truly curb any fears of a revolt.